Earth's entire thermal infrared spectrum observed | Watts Up With That? From AGU highlights, interesting, but readers should note that this is one point on Earth in Chile, not a summation of the atmospheric absorption, emission, and transmission of infrared radiation for the entire globe. The driving mechanism of the greenhouse effect, and the underpinning of modern anthropogenic warming, is the absorption, emission, and transmission of infrared radiation by atmospheric gases. The heat-trapping ability of a gas depends on its chemical composition, and each type of gas absorbs infrared radiation of different energies. The amount of infrared radiation that escapes into space depends on the net effect of the myriad gases in the atmosphere, with water vapor being the primary gaseous absorber of infrared radiation. Water vapor absorbs a wide range of infrared radiation, masking the effects of other gases. In fact, in many spectral regions (or infrared radiation energy bands), water vapor is so strongly absorbing that it makes testing the accuracy of infrared radiation absorption parameterizations used in general circulation models difficult. To surmount this obstacle, Turner et al. headed to a 5.3-kilometer (3.3 miles) altitude site in the Atacama Desert in northern Chile, where the air is extremely dry. 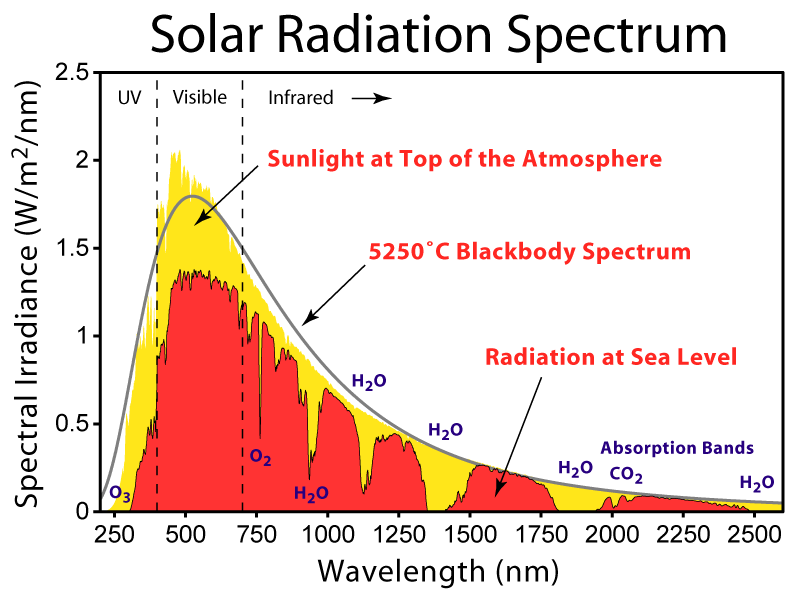 Using a broad suite of spectroscopic equipment, they produce the first ground-based measurement of the entire atmospheric infrared radiation absorption spectrum—from 3.3 to 1000 micrometers—including spectral regions that are usually obscured by strong water vapor absorption and emission. Though the data collected will likely be valuable for a broad range of uses, the authors use their measurements to verify the water vapor absorption parameterizations used in the current generation of climate models. A field experiment was conducted in northern Chile at an altitude of 5.3 km to evaluate the accuracy of line-by-line radiative transfer models in regions of the spectrum that are typically opaque at sea level due to strong water vapor absorption. 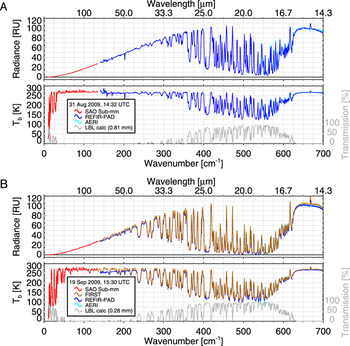 A suite of spectrally resolved radiance instruments collected simultaneous observations that, for the first time ever, spanned the entire terrestrial thermal spectrum (i.e., from 10 to 3000 cm−1, or 1000 to 3.3 μm). 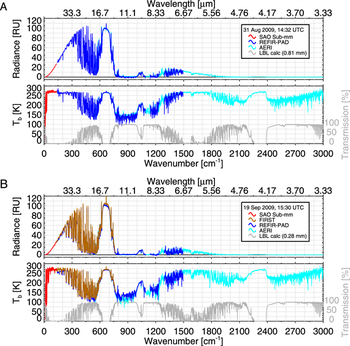 These radiance observations, together with collocated water vapor and temperature profiles, are used to provide an initial evaluation of the accuracy of water vapor absorption in the far-infrared of two line-by-line radiative transfer models. These initial results suggest that the more recent of the two models is more accurate in the strongly absorbing water vapor pure rotation band. This result supports the validity of the Turner et al. (2012) study that demonstrated that the use of the more recent water vapor absorption model in climate simulations resulted in significant radiative and dynamical changes in the simulation relative to the older water vapor model. Has there not been a space-based observation of the entire infrared emission spectrum of at least a portion of the Earth? Models models models models models models models models models models models models models models models models models models models models. Enough already. So, they have been telling us they knew these numbers for forty years, and nobody measured them before? Please explain the difference is between plots A and B. The following is based on figure 1 from the paper. At that altitude, the absorption bands are much narrower than at the surface because of both the temperature and the pressure differences. This is useful for calibrating models, but it means that the plots are of limited value when comparing them to those in other papers. On the other hand, the differences in the plots clearly show that water vapor is still a big factor at that altitude. To bad they don’t bother to say in the abstract what direction the radiometers were pointing. I think it’s sad that man’s activities are so powerful that Mother Nature is stymied. She wants the Earth to shed heat energy, but CO2 traps it. Absorbs it. Blocks it. Stores it. Holds it. How long? Well, for a long, long time which increases the Earth’s surface temperature by an average of 33C. Why are the curves scratchy? Is this due to the wavelength precision of quantum mechanics? The water vapour levels here are 1% and 3% of average Earth conditions so these are extremely dry conditions. Yes. Although you aren’t saying it quite right. There are absorption lines where there is a molecule in the atmosphere that strongly interacts (in “resonance”) with a given frequency/wavelength. For many of the molecules, there are so many resonances that they form “bands” and absorb over a broad range, not at a sharp line. There are also line broadening dynamics in place, notably thermal/doppler broadening (where the doppler shift of a given molecule “tunes” it to an outgoing photon that wasn’t strictly resonant with it). However the edges of the broadened bands are still quite sharp, so you’re seeing quantum structure. It should be noted in connection with kencoffman’s rather trollish comment that these observations tend to support the theory that water vapor is so dominant as an infrared absorber that the effect of carbon dioxide is extremely limited if it can be identified at all. So…. except for some very dry regions of earth, which are so uncommon that this team had to go to great lengths just to find a suitable test site, water vapour so completely dominates the effects of all other GHG’s, that they are insignificant to the point of being nearly impossible to measure. What a gem! Own goal! Own goal! OTOH, doing it in the Chilean desert, which is the driest place on earth (that;s why they put IR telescopes up there) eliminates much of the water vapor continuum, which is probably the biggest remaining uncertainty (everything else is nailed down really strongly, there is a bit more uncertainty wrt the water vapor continuum which is intrinsically hard to model. The post title would better be put as “Earth’s entire thermal infrared spectrum observed under extremely dry conditions”, which is the novelty here. Doing so allowed the authors a very precise test of radiation codes. FWIW, Antarctica is also high and dry, at least in the atmosphere, but it is also cold, so the amount of IR emission from the greenhouse gases is low. The entire spectrum has been measured many places, just not many places so dry. Without the pay-walled paper, I’m a bit confused by what the authors mean by that. Are they saying that the science wasn’t as “settled” as we were so often told? Or that the models were not “settled”? Without wanting to insult the authors, these days I have trouble even taking the word “observed” in the abstract at face value, until I can see the whole paper. “Models models models models…” There is nothing wrong with using models – as long as the models represent something with some degree of accuracy. Engineers (like me) use models for everything. However, they have to represent the characteristic we’re studying, or they’re useless at best, and result in devastating lawsuits and deaths at worst. Engineers in the private sector require proven models (at least match history) before we can use them. That is why you see people like Burt Rutan laugh at the noise climate science puts out. They don’t match real world results, which to an engineer means they’re useless. That is why I have a hard time seeing MSM climate researchers (I don’t know how else to describe them) as scientists – they’re willing to accept poorly correlating results. No hard scientist or engineer would do so – at least for something on which his career depends on. hmmm.. So the modern models treat water vapour somewhere near correctly when there is basically no water vapour.. is that what they are saying ? Water vapor absorbs a wide range of infrared radiation, masking the effects of other gases. So we choose to ignore it. With a black body absorber there are no notches or scratchiness…correct? In determining the atmospheres relative relative energy absorption ratio compared with a black body, we would have to know how wide the scratches are and how wide the notches are? right? It is an integral of the absorption spectrum. Are the scratches effectively smoothed out due to real world allowances like Doppler and natural variability in the absorption quantas. Ie a molecule of water (H2(16) O) absorbs 3657.1 cm-1 +/- how much? How close to 3657.1 cm-1 does a photon have to be to be absorbed? Is it fair to smooth the absorption lines to null the scratches? So that means that the Infra-red spectrum begins at 700-800 nm; not 3.3 microns. And between 750 nm and 3.3 microns, common GHGs suchas H2O and CO2 have very significant absorption lines and bands between 750 nm and 3.3 microns. So please don’t insult us by claiming you made a COMPLETE earth infra-red spectrum, that only goes from 3.3 microns to 100,000 microns. And I would hardly call these spectra THERMAL spectra. A thermal spectrum does not contain discrete spectral lines, which are characterised by atomic, and molecular resonances, related to atomic or molecular structure. Thermal spectra are a consequence of Temperature only, and are unrelated to any atomic or molecular electron energy transitions; they are continuum spectra; not closely spaced line spectra. There are no gaps anywhere in a thermal spectrum;no matter how high a wavelength or frequency resolution spectrometer you use, you can never resolve a thermal spectrum into discrete line frequency components; there are no frequencies absent from a thermal spectrum. And notice that they plot their spectra on a wavenumber or ersatz frequency axis, instead of a wavelength axis. This of course has the effect of shifting the spectral peak to a different wavelength, closer to the CO2 molecular LINE/BAND absorption wavelengths, rather than peaking at around 10.1 microns, which is where a 288 Kelvin Thermal spectrum peaks. This wave number approach, perpetuates the myth, that Thermal spectra contain only discrete spectral lines, and result in photons with only certain energies. In a Thermal spectrum ; between any two photon energies, no matter how close in energy, there exist an infinite number of intermediate photon energies. This is not true of a line spectrum, such as make up the absorption band spectra of common GHG moleculees. Water water everywhere nor any drop to drink. Water water everywhere the climate wonks ignore. I see I gave them too much credit; their COMPLETE EARTH THERMAL EMISSION SPECTRUM only goes from 3.3 microns, to 1,000 microns; not 750 nm to 100,000 microns; maybe its 100,000 nm I meant to say. And I should emphasize that it is a common misconception, that a black body radiation spectrum, which is a true Thermal spectrum (albeit theoretical), consists of millions of extremely closely spaced spectral lines, so that only certain values of PHOTON ENERGY can be found. That isn’t the case. The Planck derivation of the correct Black Body Radiation spectrum, is a product of CLASSICAL PHYSICS; it is not quantum mechanics. Any value of photon energy (and frequency) is present in the black body radiation continuum. NO photon energies or frequencies, are absent from the black body radiation spectrum. It is certainly true that the photon energies and frequencies are related by the Planck/Einstein relation, E = h (nu); but every value of E and (nu) is allowed, and present in black body radiation, or ANY thermal spectrum. That constraint simply requires that there must always be an INTEGER number of photons, at any grequency; you can’t have k\fractional photons; buty they can have ANY energy value whatsoever. Masking the effects of other gasses, or absorbing the infrared that those other gasses (*cough*CO2*cough*) would have otherwise absorbed, making the increase in such secondary gases moot because H2O already absorbed the infrared in that spectrum? Short form: CO2 absorbs and re-emits IR to equal amounts. Resulting in scattering and of course emission to space, not “trapping” as warmist scientists so frequently write in editorials. You can count the “trapping heat” meme as a lie. Well The Atacama, and Antarctica vie for the distinction of having the dryest atmospheres; but I’m happy to accept the Atacama; it’s an interesting place too. But as to it being an “extremely dry” location; just what does that mean in real terms ? Let me put it this way; what is the molecular abundance of H2O in the Atacama atmosphere; and is it higher or lower, than the Atacama atmospheric CO2 molecular abundance ? Surely, that would be a metric as to whether Atacama is truly dry; or not. Hats off to Rabbett for pointing out that this underestimates the masking effect water vapor has on other GHGs. Well there’s a fundamental problem with Tom’s thesis. Kirchoff’s law regarding equality of spectral emittance, and spectral absorptance; requires a closed system where the materials present are in thermal equilibrium, at a single fixed Temperature , with the ambient EM radiation field present in that enclosure. So first off it requires thermal equilibrium; not LTE, and moreover it also relates ONLY to thermal spectra that are a consequence of the Temperature ONLY; so it does not apply to atomic or molecular line or band spectra. There are many examples of photon absortion leading to an excited state, where the converse transition is prohibited, and therefore cannot occur; many laser systems depend on that simple fact. Well the common Helium/Neon gas laser is such a system. People need to stop traipsing out Kirchoff’s law as the explanation for every climate modelling problem; it simply doesn’t apply. And you’re right John because your models include all appropriate parameters, the values of which have been empically determined. Most unlike “climate science models”. Yep, and us Engineers are always testing the validity of the models we use. If the model doesn’t fit the data, we don’t go adjusting the data until the model does fit. Imagine that, doing a deflection test on a bridge.. ooo look, there is more deflection than the model says there should be.. lets just modify the deflection test !!! Or.. “we compacted that clay core in the dam according to the consensus, but the test says its not compact enough yet”…… “oh, we better go with the consensus” !! What I don’t get … is where the energy is supposed to go AFTER it’s been absorbed by an atmospheric molecule. Where’s the heat sink? The gas becomes warmer — then what happens? Surely it’s transferred by convection to other molecules or re-radiated. How is it “trapped”??? If it’s re-radiated, it’s not going to warm the earth (or our oceans) because that would violate the first law of thermodynamics (the earth is warmer — else it wouldn’t be radiating in the first place). Any re-radiated energy is either going to be absorbed by colder gases or go off into space. Seems to me that only convection applies and then only when warmer air moves over cooler land or water. But CO2 has a much lower specific heat than water vapor (like by two and half) so it’s not going to hold a lot of energy compared to H2O– and there aren’t a whole lot of CO2 molecules (vs H2O molecules) in the atmosphere anyway (like twenty five times less — .039% vs. 1% on average). And water vapor captures a much broader spectrum of IR than CO2. So, how is this “global warming” supposed to work? How can CO2 make any difference? What I don’t get … is where the energy is supposed to go AFTER it’s been absorbed by an atmospheric molecule. Where’s the heat sink? The gas becomes warmer — then what happens? Surely it’s transferred by convection [and conduction (collisions)] to other molecules or re-radiated. How is it “trapped”??? You’ve pretty much answered your own questions. Through equipartition if there are any other ir active molecules nearby their temperature will also go up momentarily and they will radiate more than before at all lines they could possibly radiate at. There is also the much smaller radiation of the atmosphere itself through collisions with various other molecular species (inter-electron interactions). You cannot “trap” heat in a real atmosphere to any meaningful degree at a macro level. Heat will pass through the system according to the macro temperature differences any way you look at it, except at very small atomic scales. It all has to do with the scale you are looking at. If absorption in one layer makes it warmer but you are looking at the difference across many levels then that one layers increase is meaningless overall, the same energy will pass through layer one and layer ‘n’ no mater what the temperature of n/2 is (Stefan-Boltzmann). However, if you are looking at only one, two or three layers then you can play some real “tricks” with this limited viewpoint. AGW proponents absolutely *love* to speak in small layer number examples! The smaller the better to eat you up my dear. So why is their “universal” agreement that the nearly meaningless contribution to atmospheric CO2 by mankind’s burning hydrocarbons (compared to natural sources of atmospheric CO2) contributes even slightly to the earth’s ambient temperatures? Surely if the sun went dark we’d quickly freeze, right? How is the earth supposed to retain more heat (by virtue of its having a trace more atmospheric CO2)?? I don’t see a heat sink. Moreover, no one is creating Carbon. All’s we can do is return to the atmosphere, from which all those lovely green plants will take it. And the more CO2, the faster green plants will grow. And plant growth requires energy — which comes from the sun — which leaves less energy to be radiated from the earth. I really, really don’t understand how more CO2 is supposed to make any difference in the ambient temperatures. No, it means they are applying additional checks to previous measurements and calculations. You missed an important takeaway and that is the importance of water vapour diminishes with altitude. It’s real easy to find areas of the world which are extremely dry David. Just go outside and look straight up. At 10km high where the jumbos fly the temperature is -60C. Since water freezes at 0C there is no water vapour to speak if there. The desert was dry not just because it is in a rain shadow but because of the altitude. And it’s easier to deploy the spectrometers at ground level than it is from a jumbo. What I don’t get … is where the energy is supposed to go AFTER it’s been absorbed by an atmospheric molecule. GHGs absorb IR emitted from the surface and then re-emit it. They re-emit it in all directions, so some of what they re-emit goes back to the surface and causes it to warm more (or, if you prefer, cool less) than it would have done otherwise. GHGs don’t absorb direct sunlight much because the Sun, being so much hotter than the Earth, emits much more in the visible and UV part of the spectrum that GHGs do not absorb. The first law is not violated, since it applies only to a closed system (and in the case of the Earth, there is energy input from the Sun). Another way to think of it is that GHGs act like little mirrors, and no one would argue that mirrors are incapable of reflecting because they are cooler than the Sun. CO2 makes a difference because it is non-condensing. Water vapour OTOH condenses, as rain, so cannot build up the way CO2 can. My undergraduate education was in Physics (waaay before grade inflation) and I did take a course in Thermodynamics — and it doesn’t work as you suggest. The first law (of thermodynamics) is that heat always travels in one direction — from hot to cold(er). It’s not like gas pressure or a chemical reaction which can (and does) go in both directions (unless there’s a precipitate). You can’t make a surface warmer by “reflecting” back heat that it’s radiating. George, They don’t have to insult you, you insult yourself. The IR spectral region is broad. So they explicitly narrow it by referring to the thermal IR spectrum. That means the frequency range defined by the black body radiation of the earth. The green house gases are excited by thermal energy so their emissions are restricted to the blackbody radiation band. The rest of what of what you say George is also a confused mishmash of wrongness. Resulting in scattering and of course emission to space, not “trapping” as warmist scientists so frequently write in editorials. You can count the “trapping heat” meme as a lie. Your description of the physics is correct. But the trapping thing is not a lie its a metaphor, signifying that the atmosphere has some resistance to the outgoing passage of energy. Wrong again. Lasers depend of establishing a population inversion. The excited state population for HeNe lasers is not established by an absorption from the ground state. Your claim that emission and absorption on a particular transition can be one way is totally false. The rest of what you said is confused nonsense. DirkH is correct. The models referred to in the article are radiative transfer models or radiation absorption models. They are not GCMs aka global climate models. This convective heat is lost to space by Altitude Attenuation. The convective heat wave rises into thinner and thinner atmopshere until there are no adjoining molecules to share energy with. My Poe detector is beeping softly. Faux are you taking the micky on these good WUWT folks? But the IR emitted by the Sun is mainly short wave IR, which is not absorbed by GHGs. CO2 is not only weakened by other overlapping GHGs, it is also weakened by its own broadening. The broadening from the Doppler effect has a tendency to create a flow of energy from the highly saturated center of the band toward its edge where the energy will move out of the atmosphere more easily. As you know so much, perhaps you could confirm that all jumbos make contrails above 10km in all circumstances. If they don’t, where does the water in their jet efflux go? I was going to say “they are lying to you, John”, but then I took a cold shower and noticed the word “MAINLY”. Yes, they have taken care of an alibi, of course, this is how the things have been done in climate science in recent times. 3/4 of the earth surface is covered by water. The water vapour immediately above is thousands of ppm. By their own admission, for the vast bulk of the earth surface, co2 concentrations are so overwhelmed by water vapour, that they can hardly be measured. At 10km up, there is very little water vapour as you suggest. And what happens to any LW that gets absorbed and re-radiated? Why it runs into that wall of water vapour at lower altitudes. The NET heat flow is from hot to cold. Take a look at the SB Law formula. There is no term in the formula for the temperature of the surroundings. A body radiates based on itz temperature. Not on the object next to it being hotter or colder. If the flow of energy between two bodies was strictly one way, then I could shut off the lights of an on coming car by turning mine on bright. But I cannot. Energy flows are always in ALL directions, and the 1st law refers to the NET between two surfaces. This is real science and I’ve often wondered why we don’t see more of it. There’s an area near my city where most of our coal powered electricity stations are and I reckon when the air is still you might find higher concentrations of CO2 than usual in that region. Imagine if similar spectral readings were taken during a high CO2 period and again when CO2 was at lower levels, then compared. Perhaps the answer would be too revealing. Ya yes, CO2 does not condense and as water does. But what JohnB fails to mention water vapor is constantly being replaced. JohnB also fail to mention the short wave radiation from CO2 only accounts for .05C the the surface “temperature” which means the other GHG, water vapor being 93% of GHG’s, account for 32.05C of the “Green House Effect”. Since we are carbon based, the real “bogie men” are Corrupte Politicans and Business People who want to use CO2 as the ultimate controll mechenism over life as we know it. Strange, I must have been lied to when I was told that we were flying at 34,000 feet up and looking out the window and UP as we flew around the storm and seeing the top of those cumulonimbus clouds passing by. No water up there….nope…none at all…nothing to see here…. and that folks…is why there's no snow on top of Mount Everest.at nearly 30,000 feet. No, that’s the second law. Can see how H2O does absorb completely in the high infrared with CO2 kicking in as that starts to fall. Then at 4um there’s another more minor CO2 band which sits isolated, though that isn’t matched by equivalent upgoing/outgoing thermal – and the other is already fully absorbed by water and doesn’t match outgoing. So it’s really only the additional fill-in which CO2 adds to H2O’s falling absorption which is relevant. That is handy, thank you. I notice that oxygen seems to have a significant effect. That stuff measures in the 100’s of thousands of parts per million! I must write to my MP about it immediately and see what they are doing about it! There is no motivation in this. That is what the comparison of IPCC’s projection with the observed data shows. “As he formulates his final theory, the scientist subjects it to intensive criticism. Seeking to make it as useful as possible, he asks himself: Is this proposed law universal throughout the extent of space and the passage of time? Does it lead anywhere? Does it predict one state of affairs as arising out of another? Can it be transposed from one frame of reference to another and still remain valid? And finally, because of his innate passion for orderliness, his aesthetic appreciation of things which are meet and fitting, he asks: Is this theory as elegant as possible? Could I formulate it more succinctly? Now comes the moment of verification and truth: testing the theory back against protocol experience to establish its validity. If it is not a trivial theory, it suggests the existence of unknown facts which can be verified by further experiment. An expedition may go to Africa to watch an eclipse and find out if starlight really does bend relatively as it passes the edge of the sun. After a Maxwell and his theory of electro-magnetism come a Hertz looking for radio waves and a Marconi building a radio set. If the theoretical predictions do not fit in with observable facts, then the theorist has to forget his disappointment and start all over again. This is the stern discipline which keeps science sound and rigorously honest. Most FTIR, and IR equipment outputs spectra with the larger wave numbers on the left. The Aldrich IR spectra library and reference book are published with the larger wave numbers on the left. It would have been politically incorrect if they had pointed out the 546, 2340, and the 2345 wave number adsorption peaks of CO2 in the transmission spectra. Try and find them. Whenever data is presented in an unusual manner I become very suspicious. If this new data is incorporated into Hansen’s climate model, will the model reflect the measured “global temperature” history given the measured rate of atmospheric CO2 increase? I doubt it. Given what I have read about paleoclimate, water plays the most important role in climate modulation. It has thermo functions in all 3 states transfering heat by conduction and convection as well as radiation. If the role of water was well understood and made the focus of climate models, I suspect that they would track the measured data reasonably well. But then there would be no cause for alarm and we could get back to more rational thinking. Extracts of “CARGO CULT SCIENCE” by Richard Feynman: Adapted from the Caltech commencement address given in 1974. The idea is to try to give all of the information to help others to judge the value of your contribution; not just the information that leads to judgment in one particular direction or another. We have learned from experience that the truth will come out. Other experimenters will repeat your experiment and find out whether you were wrong or right. Nature’s phenomena will agree or they will disagree with your theory. And, although you may gain some temporary fame and excitement, you will not gain a good reputation as a scientist if you haven’t tried to be very careful in this kind of work. I would like to add something that’s not essential to the science, but something I kind of believe, which is that you should not fool the layman when you’re talking as a scientist. I’m talking about a specific, extra type of integrity that is not lying, but bending over backwards to show how you are maybe WRONG, that you ought to have when acting as a scientist. And this is our responsibility as scientists, certainly to other scientists, and I think to laymen AS WELL. Couldn’t see the 10 micron window. Nearest is 14.3 microns. This will warm a black body surface to a peak temperature of about -70C (202.7K). Any longer wavelength radiation will have even less warming effect. What was the point of this exercise? Even in the Atacama, wouldn’t there still be quite a lot of water (measured in PPM) relative to CO2? Perhaps LT should spend some time examining the actual behavior of the gasses, liquids and solids that comprise Earth’s atmosphere, instead of spewing stupidity like a ruptured comic book; to put it metaphorically. Y’all will continue to talk past each other until you take on board that to promote the AGW claim they re-wrote physics. AGW doesn’t have convection. Why not? Because they have no atmosphere around their Earth. They have only the empty space of the container in an imaginary lab with imaginary gas molecules zipping around it, that is, their molecules are ideal gas. First get to grips with this, that their molecules don’t exist in the real world and then you’ll be able to work out where the dumb ideas are coming from. Likewise thermal infrared, they don’t have it direct from the Sun. In the real world the invisible thermal infrared is the heat you feel from the Sun, it has they power to warm you up and to heat up land and oceans. AGWScience Fiction has replaced that with the claim that it is shortwave, Light, which heats up matter – this is so stupid only by constant repetition and brainwashing education is it possible to think this is reality. There is a great difference between the straight line trajectory of thermal energy of the Sun directly impacting Earth and heating it and secondary effect entropic heat unable to do effective work. Visible light cannot heat matter. All electromagnetic energy is not the same. The opposite are memes produced by the meme producing department of AGW Science Fiction inc. created by tweaking real world physics. It has created a generation which has no idea how the world works, that’s how it can continue to make idiotic claims such as “carbon dioxide traps heat” and “visible light heats oceans” and “the atmosphere is empty space”. They have no sound in their atmosphere because their atmosphere isn’t an ocean of real gas with volume, weight, attraction, subject to gravity. Their fake fisics is full of these memes, none of which explain the real atmosphere or the real properties and processes as is still available in traditional physics teaching, and they create them by tweaking real physics – in their empty space ideal gas scenario it is done by excluding van der Waals in the history of our understanding in physics. Simple trick, just as they only refer to Arrhenius’s first paper, not his own correction later, nor the debunking of it by Wood, nor the fact that he got the wrong end of the stick and misunderstood Fourier. Every bit of the their fisics is made up of like memes created out of the imagination, and, they have no internal coherence with their examples and so called experiments full of logical disjuncts and mixing and cherry picking out of context laws and explanation from real physics, so don’t bother trying to argue physics against fisics without first establishing how they created their fictional meme, because they won’t understand you. Because they’re describing a completely imagined world. Think of it as a fantasy fisics like a science fiction variation and it’ll keep you grounded..
Well that is not correct either. “Heat” if such a “thing” rather than a process exists, DOES travel in Both directions; from hot to cold and verse vicea. It is the direction of THE NET FLOW, that is from hot to cold. The Clausius form of the second law states that it applies to cyclic machines; not uni-directional ones (if such things can exist. If there is ONLY a one way path; how could the source possibly know that the sink is actually hotter. We teach so much incorrect rubbish in Physics classes, it is downright embarrassing. For example we teach that “light” is “reversible”. Well at a fundamental level; “light” is generated ONLY by the human eye, in response to EM radiation in the 400-800 nm wavelength range. I have never heard of EM radiation being emitted from the human eye, in response to some mental immage conjured up in the brain. But “light”, as we use the term colloqially in the branch of physics known as optics; is taught as reversible. you can interchange object and image; source and sink, and the system behaves exactly the same. NO IT DOESN’T; not even in the most trivial optical system containing no more than a single optical interface. What IS reversible, is the direction of the completely fictitious rays of GEOMETRICAL OPTICS, which is simply applied geometry. It is a simple mathematical MODEL, that real electromagnetic radiation does NOT adhere to; only approximately. The EM radiation energy of real optical systems is NOT reversible. If a “light” beam impinges on a plane refracting surface between two media with different refractive index, two daughter beams are generated; a reflected beam obeying the reflection law of GEOMETRICAL OPTICS, and a refracted beam obeying the refraction law (Snell’s law) of GEOMETRICAL OPTICS. So if I reverse the reflected and the refracted beam, I will get the original incident beam back, going in the opposite direction; right ? No I won’t, I instead get two new beams, one obeying the law of reflection and the other obeying Snell’s law from GEOMETRICAL OPTICS. The exact same problem occurs in a transmission line, when a signal arrives at a place where the characteristic impedance changes; you get a transmitted signal, and a reflection off the impedance discontinuity, and you can never recover the original signal. In both the optical interface, and the transmission line discontinuity case, it is simply Maxwell’s equations of electromagnetism in operation in a different frequency range. From that formalism we get “mu nought”, the permeability of free space, and “epsilon nought” the permittivity of free space. mu nought times epsilon nought has the dimensions sec^2/metre^2, the square root of which is 1/c; the velocity of EM radiation waves. And mu nought / epsilon nought has the dimensions of Volts^2 /Amps^2; the square root of which is Ohms, and the value is 120 pi Ohms = 377 Ohms; the characteristic impedance of free space, as a transmission medium for EM radiation waves. If you paint your aeroplane with 377 Ohm paint, it will vanish, because it will generate no reflection of any EM radiation. People need to get this “heat flow” thing out of their heads. It requires a physical material medium for “heat” to propagate; which is why none of it can get here from the sun; and that medium provides a heat transport process that works in any direction. But the net transport of energy in the form of heat only works from a hotter source to a colder sink. You cannot illuminate a region with EM energy, say in the light wavelength range, in such a way that a person whose eye, is placed there to receive that EM energy, cannot see the source of that illuminating energy. That is the classic GLARE problem of illumination engineering. And when a doctor tells you you’re gonna die when you go out in the sun it’s just a metaphor because what he really wants to say is that sunlight might increase your risk of developing skin cancer in a few decades by a tiny amount. Go defend them all you want. Why do they never confront a skeptic scientist in a debate? Maybe I’m missing something, but from a scientific method point of view I fail to see how the experiment outlined in the article establishes anything. I have read the abstract and the paper presented and, for one thing, from the information I have read there is so much of the methodology missing that I would be unable to duplicate the experiment they describe. Which way were the meters pointed – were they measuring incoming IR from space or were they measuring outgoing IR from the earth’s surface? What were the meters used? What was the ambient temperature and humidity at the time the readings were taken? At what time of day were the readings taken? What was the air pressure at the altitude where the readings were taken? What were the partial pressures of the gases present? There is so much data which is missing which makes it impossible to confirm whether their spectral data was reproducible or not. I point out that IR telescopes, in particular, are located in such places as the high Andes in the Atacama desert so that they can avoid the fact that the earth’s atmosphere absorbs incoming IR radiation and makes IR readings from outer space highly unreliable. The Hubble Telescope was designed to take advantage of the fact that the atmosphere was avoided and it has been making IR observations from outer space for decades. As far as IR radiation from the earth goes, other satellites have also been making IR readings of the earth’s surface for decades. Anyone who has access to the data from those satellite readings should be able to easily deduce the absorption spectra of Water Vapour and use it to make the corrections to the absorption models that they talk about. To me, this experiment and it’s purpose is redundant to information and data that is already easily available and serves as an example of a group of people who were trying to justify scientific junkets to countries such as Chile. The IR spectral region is broad. So they explicitly narrow it by referring to the thermal IR spectrum. That means the frequency range defined by the black body radiation of the earth. So enlighten us all Lazy T. The earth surface mean Temperature is reported to be about 59 deg F, 288 Kelvins. What is the lowest frequency and the highest frequency contained in the “complete thermal radiation spectrum” of a 288 Kelvin Black Body emitter. And why not give us a peer reviewed reference source for you numbers; and don’t bother feeding us any wiki rubbish. And lazy, you need to stop exporting your very limited knowledge as being the confusion of others. So put up or shut up. What are the frequency range extreme limits of a 288 Kelvin black body radiation spectrum ? And the Temperature at Vostok Station in Antarctica gets down to almost -90 deg C, so ovviously there is no water vapor to precipitate there either. What if they tried this out in the Congo forest? 😉 The above says it all really. I’m going to link to this thread the next time some skeptic says something like “no skeptic denies the grreenhouse effect or that CO2 warms the planet, the question is just ‘how much?'”. In reality you will find different skeptics believe a whole range of things, many of which are mutually exclusive. I like to sum up skeptic belief as ABC – “Anything But CO2”. Paul Westhaver, to get something of an idea of what you are interested in (the broadening effects of pressure and temperature), go to Spectralcalc. and then select gas call. On the gas cell page set the waveband to be between 2030 and 2050 cm-1. This should bring up a few lines in one of the water vapor bands when you calculate it. Now go to the gas cell tab at the top of the card and play with the temperature (mostly affects Doppler broadening) and the pressure (mostly affects pressure broadening). That should give you some feeling for what is happening. I must agree with JohnB. It is really sad that so many ‘sceptic’ commentators don’t seem to even understand the basics. Information is widely available on the internet for those who truly seek it. Failing that, they they could learn a lot from Lazy Teenager who hasn’t put afoot wrong yet. There is no excuse for some of these uninformed comments. It gives scepticism a bad name. The study in this topic prompts concerns about its methodology. The study was supposedly performed slightly above the planetary boundary layer seen at sea lavel by the Pacific Ocean coastline. This raises the question about the effects of the gases in that planetary boundary level above sea level and below the altitude of the Atacama test site? We are told the Atacama test site located above the coastal planetary boundary layer was extremely dry, but is there information about measurements and observations of water vapor and humidity in continuous observations from AGL (Above Ground Level) from Atacama to the upper boundaries of the Earth’s atmosphere? If so, what were the temporal variations in water vapor, humidity, cloud formation, and contrail formations at the various altitudes AGL in the diurnal and seasonal cycles? If the above values are unobserved, how can this study purport to have observed the true values for infrared transmission to outer space, especially when they attempt to report such radiatoin as discrete frequencies for infrared energies? They seem to have missed the microwave part of the spectrum and there is a lot of that radiating away from the atmosphere. I know from observation that microwaves heat water very well, or my microwave oven works by magic. Mind you that does not mean that the radiated microwaves add to global warming. I’m not certain that ‘masking’ is the proper word to describe the effect of water vapor on other HGH gases. ‘Masking’ implies that these ‘other’ gases still have some effect in the presence of large amounts of water vapor, we just can’t see it. I think it is more accurate to describe it as ‘eliminates the effects’ since water vapor ‘absorbs’ all the IR there is to absorb. I’m going to link to this thread the next time some skeptic says something like “no skeptic denies the grreenhouse effect or that CO2 warms the planet, the question is just ‘how much?’”. In reality you will find different skeptics believe a whole range of things, many of which are mutually exclusive. I like to sum up skeptic belief as ABC – “Anything But CO2″. The question of “how much” accurately includes positive, negative, and no effect to describe what is known. Since the proportion of CO2 in the atmosphere is a mere trace that is orders of magnitude smaller in proportion to the aggregate atmosphere than the resolution that can be obtained in any temperature measurment as used by carbophobic minions to claim a CO2 influence, and there hasn’t ever been proof that the miniscule effect that CO2 might have is warming, cooling, or not affecting the temperature of the planet, your assesment of the skeptic belief as ABC seems inaccurate. A more correct acronym might be EBC. That which affects Earth’s climate is , everything but CO2. OK, a serious question, if I am being stupid I’m sure someone will point it out. If the effect of water is negligible in their measurements, is it not the case that a reading of the IR spectrum when the sun is high, preferably overhead will differ from one taken when the sun is lower by the extra absorbtion resulting from a longer trip through the same atmosphere? Given the differences, would it not be possible to calculate the effect of a different amount of GHG? Won’t that tell us how saturated the CO2 is, and how much extra absorbtion it is capable of? “The last important point to consider is that sometimes people get confused about the relative magnitude of solar and terrestrial radiation – for example, with the first graph in the post the solar radiation is much higher than the terrestrial radiation. But this is because the solar radiation in that example is the value close to the surface of the sun. But the earth only receives about one two-billionth of the solar radiation due to its distance from the sun. The answer to Blue John is in essence the same, there is very little energy in the microwave emission from the earth (essentially a 300 K black body). You can use the black body calculator at Spectralcalc for this, but roughly speaking there is about a billion times more emission at 12 microns (near the peak absorption of CO2), than there is where your microwave oven emits (30 cm or 1 GHz). I’ve said it before, you could directly measure the IR “backradiation” by point your instruments directly upward at the poles or at night in other areas; the poles would be very dry too. One could profile the humidity by balloon at the same time if not in a very dry place. Indeed, with a series of observations at one place, you could trace backradiation wrt humidity. These are very simple expirements. Very well said Myrrh and there’s more. – AGW enthusiasts (this includes the so called “Lukewarmers”) also like to work with averages – which is why they think it is only just and proper to divide the so called “Solar Constant” (SC) at the top of the Atmosphere, say 1368 Watts per square meter, or metre (1368 W/m²/4). This kind of averaging is another fine mess they are getting themselves into (a mess which is “seemingly” accepted by most skeptics). It does however ignore the fact that the globe is in as much darkness as in insolation. The darkness which we call “Night” is of very great importance when we try to understand how the Earth retains its heat. As you say; “AGW doesn’t have convection” – so let’s use the newfangled word “Evapotranspiration” which they do have – on occasions. However whatever we call it, convection does not happen at night. –Naturally that is – it is also greatly reduced on an overcast day. If it was not so, morning mist and fog would be unknown happenings. By the way I cannot believe it is the heat from Carbon-dioxide and Water-vapor that burns away the fog and morning mist. And – since you mention Fourier, these AGW jokers accept, or used to accept, that Fourier is the “Father of the Greenhouse Theory” which only goes to show that they have never bothered to read – or have not understood a word of what he wrote. Yes, I was trying to be funny, but only by regurgitating common, ubiquitous statements from climate “science” literature. Truly, some of the themes embraced by climatologists are not just wrong, they are ludicrous and FAIL when exposed to the most basic, fundamental engineering analysis. In an optically dense medium, the radiation can travel only a short distance before being absorbed. Consider the situation in which this radiation penetration distance is small compared to the distance over which significant temperature changes occur. Then a local intensity will be the result of radiation coming only from nearby locations where the temperature is close to that of the location under consideration. Radiation emitted by locations where the temperature is appreciably different will be greatly attenuated before reaching the location being considered. For these conditions it will be shown that it is possible to transform the integral-type equations that result from the radiative energy balance into a diffusion equation like that for heat conduction. The energy transfer depends only on the conditions in the immediate vicinity of the position being considered and can be described in terms of the gradient of the conditions at that position. The use of the diffusion approximation leads to a very great simplification in treating radiation transfer. It takes great mental gymnastics to extract GHE heating (33C!) from a dissipative, diffusive process. It’s non-physical. It’s nonsense. This is why the “mere trace” argument is bogus. CO2 absorbs and re-emits according to its partial pressure (i.e. how much CO2 there is in a given volume), not its proportion of the atmosphere. Pretty much all of the rest of the atmosphere is transparent to IR at the wavelengths that CO2 absorbs and re-emits, so in calculating the greenhouse effect of CO2, the rest of the atmosphere is irrelevant (until we look at feedbacks, of course, when water vapour and clouds become significant). Failing that, they they could learn a lot from Lazy Teenager who hasn’t put afoot wrong yet. There is no excuse for some of these uninformed comments. I for one have learned a lot from LazyTeenager. Checking his claims to find that they are out of context misleading assertions for example. I’ve also noticed the practice of TTT (Tag Team Trolling) where one troll says something misleading and another troll jumps in to say the first one is right, but without offering any actual evidence or reasoning to support that position. This is the first instance I recall though of TTTT (Triple Tag Team Trolling). Well yes John, obviously this one thread on this one issue with just 80 comments in it, many from the same commenters, represents the mainstream views of millions of skeptics. JohnB, thanks for the list. When you stop blaming all climate changes on Co2 you will be on your way to having a mind interested in science, not propaganda. Sunshine is up. Your side refuses to acknowledge it. Bull! IMO, within the mainstream of skeptics there is a tacit agreement that the warmists have overstated their case, and it takes persistent effort(skepticism) to ferret out reality from fiction. Steve McIntyre is the ideal, as he up front concedes the likelyhood of some warming, but through skeptical checking refuses to accept bad science or statistics trotted out by the “Team” to support alarmism. PS JohnB, bright sunshine is not mentioned in AR4. Will it be mentioned in AR5? Will it be graphed? Will papers written about changes in bright sunshine be mentioned and discussed? Your AGW church tends to deny the existence of gods other than the CO2 god. Really, I mean really, is ~3% of the ~390ppm/v CO2 *the* DRIVER of climate change? C’mon, there is no EVIDENCE to support that claim, none, none what so ever. I am having trouble reconciling “radiance” in the graphs (watts/m2), with the Wiki satement that over a third of the energy transfer from the sun is in the IR region. When I eyball the radiance curve, and integrate(sum the area under the curve), I don’t see anywhere near 1/3 of the energy coming from the IR region. “Infrared (IR) light is electromagnetic radiation with longer wavelengths than those of visible light, extending from the nominal red edge of the visible spectrum at 0.74 micrometres (µm) to 300 µm. This range of wavelengths corresponds to a frequency range of approximately 1 to 400 THz, and includes most of the thermal radiation emitted by objects near room temperature. Infrared light is emitted or absorbed by molecules when they change their rotational-vibrational movements. Much of the energy from the Sun arrives on Earth in the form of infrared radiation. Sunlight at zenith provides an irradiance of just over 1 kilowatt per square meter at sea level. Of this energy, 527 watts is infrared radiation, 445 watts is visible light, and 32 watts is ultraviolet radiation. The balance between absorbed and emitted infrared radiation has a critical effect on the Earth’s climate. This is , of course the “test your hypothesis” step in the Scientific Method. The. “Tropospheric warm zone” was predicted by the AGW models. Empirical weather balloon measurements did not detect this warm zone. The Scientific Method dictates that the hypothesis be re-worked and re-tested (the models embody the AGW hypothesis). The IPCC sanctioned AGW “team” have not taken this necessary step. This failure to adhere to proper scientific steps PROVES the “team” has abandoned all science. Politicians lie when it suits them. If you want to be the next Gallileo, it’s not enough just to be unpopular, you also have to be right! There is a mountain of evidence. It is summarised in the IPCC reports and a thousand other places. The problem is, you just don’t want to hear it. If I observed that Newtons apple stopped falling and started to rise, the skeptic in me would say: “but the real world does not support Newtons theory”. So.. when I saw the temperature failing to climb as predicted over the last 15 years, despite ever faster rising CO2, the skeptic in me said: “but the real world does operate the way AGW theory is formulated”. Then when I watched a video of a U of Chicago professor giving a lecture on radiative physics, I started to laugh.. he was defining a static system, and the worlds atmosphere/climate/ocean is anything but static. I wondered why do students not stand up and yell “bullshite!” Are they not able to think for themselves? I used to challenge my Professors in my day, maybe it was just in the 60s that we did that. I don’t have to. That would be the IPCC’s job. They used the money to squander fabricating hockey sticks. I don’t have to prove it was bright sunshine, all I have to to do to demolish the IPCC’s carbon cult is prove that they never considered it. As for b) …. isn’t 60 years the period in discussion? Which graphs are you referring to Ed? If you mean the ones in the paper above by Turner et al, then ALL the radiation there is in the IR region. Furthermore, it is not from the Sun, it is a direct measurement of radiation coming back from the atmosphere (i.e. the supposedly non-existent back-radiation). Although the Sun does emit in the near-infrared, it does not emit any significant IR above 4 microns. So, when we detect radiation on Earth longer than 4 microns, it is definitely NOT from the Sun. Greenhouse gases absorb radiation above the 4 micron threshold, whilst allowing short wave radiation from the Sun to reach the surface relatively un-attenuated. This is the basis of the greenhouse effect. JohnB, I want to hear your “mountain” of evidence. Post your evidence right here. Keep in mind that evidence is testable, reproducible raw data, per the scientific method. Understand that computer models are not “evidence”. And that the UN/IPCC’s NGO-written ‘reports’ are not “evidence”. And that your baseless opinion is certainly not “evidence”. It is no more “evidence” than a witch doctor’s claim that his chants and juju cures disease. So post your testable, measureable, reproducible evidence, according to the scientific method, showing that the human produced ≈3% of total annual CO2 emissions is the driver of climate change. YOU made the claim. Let’s see you back up your conjecture with real evidence, instead of your incessant, baseless opinion. If I observed that Newtons apple stopped falling and started to rise, the skeptic in me would say: “but the real world does not support Newtons theory”. So.. when I saw the temperature failing to climb as predicted over the last 15 years, despite ever faster rising CO2, the skeptic in me said: “but the real world does operate the way AGW theory is formulated”. On the other hand, you might look for someone pulling the apple up on a string, i.e. look for an explanation that does not overturn everything we know about physics. Similarly, maybe you should look for an explanation of “no warming for 15 years”, that fits in with what we know. Like, simply, that it is not true (see ocean heat content). At least you, Ed, sound like you will happily accept reality when 2012 or maybe 2013 registers as the “hottest year on record” and puts to bed this “no warming in years” nonsense. IPCC reports summarise peer-reviewed science. If you won’t accept peer-reviewed science as evidence then you are right, I have no other evidence. Rubbish! They didn’t consider that warming might be caused by pixies, either. You can’t just make up stuff and then complain that it’s not taken seriously. If you want to be taken seriously, do some serious work. Concerning the broadening of an absorption band and the overlap of different GHGs. One way to see if the atmosphere is able to weakened the highly saturated bands of absorption would be to add the down-welling radiation with the up-welling radiation and subtract the normal SB curve. It would show the flow of energy from the lows to the highs of this graph. It would be interesting if someone was able to that, specially with measurements taken with clouds. Look John, you implied earlier on this thread that “greenhouse gases” do not block a portion of the Sun’s IR (“But the IR emitted by the Sun is mainly short wave IR, which is not absorbed by GHGs. Again, it’s all in the textbooks”). Then I gave you the evidence of the opposite: http://www.windows2universe.org/sun/spectrum/multispectral_sun_overview.html . The problem is, you just don’t want to hear it. Your textbooks are lying or implying a lie, but you still have no problem with that. This is an important thing about the Sun’s IR, because it means that the first thing the “greenhouse gases” do is blocking some of the Sun’s IR, thus contributing to COOLING on the earth’s surface and the question about the net effect is wide open. Now tell me where in the IPCC reports there is a reference to this knowledge and an answer to this question about the net effect. If nowhere, then the IPCC reports apparently mislead the readers. Greg, they don’t reference it because it’s not true, or at least not relevant. The Sun emits virtually no energy at wavelengths over 5 microns (which is in the near IR). The Earth, being much cooler, emits almost entirely at wavelenths over 5 microns (i.e. the far IR), and this is where CO2 absorbs and re-emits. Or are these guys lying, too? Do you think that DOCUMENTED changes in bright sunshine are equivalent to believing in pixies? Wow. You are a true believing member of the IP Carbon Cult. For a short period of time I gave you the benefit of the doubt, but clearly you are a closed minded Troll. And Greg House is right, some incoming IR is blocked by GHG’s and the IPCC ignores that too. I posted a reference to 12W/sqm blocked by methane. You bailed. So you went from ‘thousands’ of items of evidence, and from ‘mountains’ of evidence, to… nothing. Not only are a large part of the IPCC reports ‘made up’ by NGO’s like the WWF and rubber-stamped by the IPCC, but we know that climate pal review has morphed into an evidence-free circle-jerk that cannot stand up to the scientific method. On top of all that, the planet itself – the ultimate Authority – is falsifying your admittedly evidence-free, evil “carbon” belief system. In other words, you’ve got nothing except a baseless opinion. If you would prefer to listen to the IPCC’s witch doctors, that is your business. But just so we are clear: you have provided zero evidence to support your conjecture. Rational people would back up and start over at this point. But you are not rational, you are a true religious fanatic who does not care for science or the scientific method. Magical witch doctor juju is your cup of tea. Got it. We’re clear on that. The Sun and Earths Black Body curves do overlap. More importantly, H2O, CO2 and CH4 do block a significant portion of the suns spectrum. The Sun’s spectral range is infinite, as is that of any blackbody. But nevertheless, 99% of the Sun’s energy is shortwave (i.e at wavelengths below 4 microns) and so what JohnB says is absolutely correct. The article you refer to, though not incorrect, seems to have misled you. It is important to realise that, on the graph of the solar spectrum, the the vertical axis is logarithmic and that it goes down to 10^-18, a very, very,very small number. In reality, some of the incoming solar radiation is absorbed by our atmosphere (mostly by water vapour and ozone) but much of it reaches the surfaces unhindered. Notice that CO2 has a minimal effect on the incoming radiation. It does, however, have a significant effect on the outgoing long wave radiation. And there, for all to see, JohnB exposes the true fallacy of his position. He accepts the reports of the IPCC without question, and he excludes all science not presented by the IPCC from consideration. He admits that he has no other evidence than this. For those of us who have been following the debate since AR3, this is a sad statement by anyone. AR3 is, and AR4 even more so, written in vague terms that mislead the reader in all manner of ways. References are poorly documented, sometimes so obscure that the original cannot be found, and many references have since been documented (and admitted to) as being not only not from peer reviewed literature, but also known to be false (the Himalayan glacier melt being the most famous, but hardly the only one) and admitted to by Pauchauri himself. Beyond the vague and misleading language, there are credible peer reviewed papers contrary to those quoted by the IPCC which were carefully excluded, to the point where some authors of AR4 resigned in protest. Of the papers in the IPCC reports, many have long since been debunked to the point that the IPCC never even referes to them because of the embarrasment of being associated with them. I shall give you a single example of highly misleading information JohnB, which you may research yourself. IPCC AR4 quotes the effects of a doubling of CO2 as causing a direct increase in temperature of about 1 degree C. Did you think to ask, JohnB, WHERE that 1 degree occurs? OR did you assume from the language in the report that it meant the surface of the earth? If you go looking for that fact in AR4 JohnB, as I did, you will spend many hours trying to find it, so I will save you sometime. The location at which the 1 degree can be measured is NOT earth surface, it is at the “effective black body temperature of earth”. You will have to turn to AR3 to find that little gem. Have you asked yourself what that means in terms of earth surface temps? The effective black body temperature of earth is about 255K. Quick lesson in physics, P=5.67*10^-8*T^4 with T in degrees K and P is in w/m2. The IPCC waves their hands about, wailing about CO2 doubling and causing an increase in earth radiance of 3.7 w/m2. If you plug that number into the equation above (which is well known as the Stefan-Boltzmann Law and is accepted by the IPCC as correct) you will get +1 degree at 255K. But the surface of the earth isn’t at 255K, according to the IPCC the average surface temperature is 288K. Stuff 3.7 w/m2 into that, and you will find that the number for earth surface is only about 0.6 degrees. Now why, JohnB, would AR4 be written in such a fashion as to imply a 1 degree increase in temperature at earth surface when they clearly know from their own reports and their own figures, that it is only 0.6 degrees? But let’s carry on with the thought process and see what that implies from a latitude and seasonal basis. The IPCC reports fail to bring this little factoid to the attention of the reader also. How much of a temperature increase should we expect in the dead of winter, at night, in a high latitude? Let’s figure from -40C, which would be 233K. At surface, 3.7 w/m2 would increase that temperature by about 1.3 degrees C. On a very hot day in the tropics however, let’s say +40C, the temperature rise would be only 0.53 degrees. Can you find anywhere in the discussion in AR4 where it is explained that the bulk of any actual warming would come in the dead of winter at high altitudes and that the least warming would come at noon day highs in the tropics? That, JohnB, is only a single example of the highly misleading manner in which “science” is presented in IPCC reports. I could bring up others (many others) but this comment is getting long enough. As for your blind acceptance of IPCC reports as the consensus of peer review and hence “factual” I’ll suggest to you that if the world was made entirely of people like you, it would be flat, it would be circled by the sun, the bumps on your head would dictate what psychological problems you have, all manner of diseases could be cured by letting some of your blood out, continental drift would not exist, nor treatment for ulcers, and the world would be ruled by those who control what gets printed as “truth” and what doesn’t. I choose to live in a different world than you would choose JohnB, and you have no right to choose mine for me. Well Dave, you called that , on the money; and I like your label of Tag Team Trolling. It is very appropriate for the Graffiti Tagging that Lazy T leaves all over the place. I can only have pity for someone, who will leave this planet, having never been recognized for ANY contribution to ANYTHING, because they are too cowardly to append their own name to their writings, like the street taggers of trash on buildings. Frankly, I can’t recall ANY instance in which LT has provided any learning instruction for any reader of this site; he simply vandalizes the efforts of others, and leaves nothing of value in it’s place. A truly sad disturbed individual, ashamed of his own name. Come on, seriously. Take a look at your own graphs. I prefer to listen to every single national science body, and 97% of publishing climate scientists (yes, I do know how they got that figure), and basic physics, and, and. There’s a reason for it being called the mainstream. Tell me, Smokey, what WOULD you accept as evidence? The problem is Greg, that if you go around saying that text book lie, then you are not going to win many debates with that line. We have indeed a problem with the textbooks on “climate science”, with the “climate science” itself and the political reports on “climate science”. The problem is, that the core AGW statements have no basis in real science, this does not change, if those statements are included in some textbooks, reports etc. A doubling of CO2, according to the IPCC (and also according to Richard Lindzen) will lead to to temperature increase of about one degree AT THE SURFACE of the earth. This is of course without any feedback effects, which may or not be present, which may or may not magnify this increase [ This is the only real point of dispute]. So David, cool down or take more water with it. Although the anthropogenic radiative forcing of 2.4W/m2 [IPCC 2001] is small compared to the natural one, it is of major importance to the future trend of Earth’s climate. Disagreement in Earth’s radiation budget between observations and global climate models has been a major concern in the climate community for several decades. Many attempts have been made to explain the observed excess of solar shortwave absorption, which is commonly referred to as anomalous, or excess, absorption. The solar shortwave absorption is by far the largest uncertainty in modeling the global radiative budget. Summaries of the history of the excess absorption problem are given by Stephens and Tsay , Liou  and Ramanathan and Vogelmann . Widespread scientific interest in this topic was revived in the 1990s by a comprehensive analysis of satellite, aircraft and ground-based measurements, supporting the existence of excess absorption and quantifying its magnitude to be about 25 – 30W/m2 [Ramanathan and Vogelmann 1997]. Numerous attempts have been made to resolve the problem, but all potential mechanisms on its own fall far short of explaining the estimated 25 – 30W/m2 excess absorption. “On the other hand, you might look for someone pulling the apple up on a string, i.e. look for an explanation that does not overturn everything we know about physics. Similarly, maybe you should look for an explanation of “no warming for 15 years”, that fits in with what we know. Like, simply, that it is not true (see ocean heat content). Once I look for another explainations(for why we are going sideways on temps for the past 15 years), I can see 30 yr/ 30 yr cyclic variations in temperature, going back 100+ years. Then I am left with “could the 1980 to current time just be a 30 year up cycle?”. So, to answer your second postulate, about 2012 and 2013.. I would have to say that you pose a false concept, namely that ANY tiny warming is “proof”.. no, the Hansen curves and the IPCC models have all FAILED to predict/project the current temperature. I would say that anything less than achieving 60% of their predictions/projections is proof of a major flaw in the AGW radiative physics. So far, this ex GW believer sees massive FAILURE! A doubling of CO2, according to the IPCC (and also according to Richard Lindzen) will lead to to temperature increase of about one degree AT THE SURFACE of the earth. According to REAL science called physics “greenhouse gases” can not cause any significant warming: http://www.wmconnolley.org.uk/sci/wood_rw.1909.html . Please AGW fans, – prove me wrong! 1)	It shares the temperature (T) with its environment. If anyone say we do not know exactly what that T is I will concede that neither do I – but it must at worst be a bit above “Absolute Zero” (0K) ? 2)	It has an internal heat-source in its core which, in spite of the fact that this is there for “scientists to study” they cannot accurately establish the value of “T” or “Core Temperature” nor how the process by which this temperature comes about can, be –or seemingly – is eternal. 3)	The Earth’s surface absorbs the rays from the Sun. The Sun is the only heat source – of any consequence – in our environment, It is the only supporter of life as we know it. Points 1) and 2) above may deserve further investigation, but not by us – and not here and now. 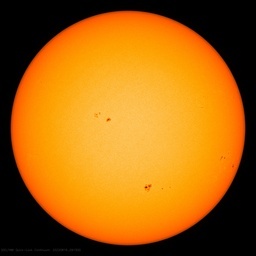 According to REAL science called “physics” “greenhouse gases can not cause any significant warming: http://www.wmconnolley.org.uk/sci/wood_rw.1909.html . It’s getting a little tiresome reading and rereading all the misinformation and misleading information that gets repeated here, about what the sun, and the earth and black bodies, do and do not emit and or absorb; constantly dispensed by MikeB and others; Myrhh. MikeB thinks sun’s radiation reaches the ground relatively unattenuated. That simply is untrue. The latest current NASA approved value of TSI is 1362 W/m^2 roughly. Detailed data on this can be found in standard Texts, such as The Infra-Red Handbook, compiled by the Environmental Research Institute of Michigan for The Office of Naval Research, Department of the Navy. Odd, that the UNited States Navy would have an interest in infra red radiation about the earth. In the section on The Sun, they tabulate standard data from an era when TSI was 1353 W/m^2; the value I grew up with before the age of satellites. So they have a detailed table of TSI for Air Mass zero, meaning, outside the atmosphere. So if place the end of the visible spectrum at 700 nm as many do, then that part of the 1353 wm^-2 is 46.879%. If you place it at 800 nm, which is where I normally do, even though my eyes can no longer see that, then you get 56.023%. Splitting the difference at 750 nm and the visible range contains 51.691% of the solar energy, leaving 48.309% of AM-0 solar energy in the Infrared. So how much of that arrives at the earth surface after being “relatively unattenuated by MikeB’s atmosphere ? For that we have to go to the Air Mass 2 table for 60 degree incidence angle (from zenith, or 30 deg altitude angle) for that oblique angle the Fresnel reflection coefficient for the atmosphere is higher than for normal incidence so they compensate for that with an adjusted TSI of 1322Wm^-2 instead of 1353. The atmospheric absorption will of course change the spectrum somewhat from the normal Air Mass 1 spectrum. Unfortunately, they didn’t calculate the integration from zero wavelength, but one can calculate the percentage of the AM-0 Spectral transmission from the two tables. At 700 nm we get 1108.0 wm^-2/micron versus 1369.0 or 80.935% transmission. At 750 nm, it becomes 867.0 / 1235.0, or 70.20%, and at 800 nm it is 857.0 / 1109.0 for 77.28%. Those still awake, will catch the lower value at 750 nm compared to 800; a direct consequence of an H2O absorption band thereat 750 nm. I’m not going to be bothered calculating the numbers for you for all of the IR absorption bands due to H2O, CO2, and other GHGs; I’ve told you where to find it. Also I would point out for the CO2 crowd, that the photon energy of a typical 15 micron CO2 absorbed photon, is just 20 times less, than one of those 750 nm H2Oabsorbed solar photons. So atmospheric HEATING, due to GHG (mainly H2O and O3, and CO2) by high energy solar photons; about 25% of the incoming TSI ALL OVER THE SUNLIT HEMISPHERE, is perhaps worthy of some small consideration compared to the average 390 W/m^2 total emission from a 288 K near black body LWIR source; only a small fraction of which (of the 390 wm^-2) of which is lost to CO2. Add to that, the simple fact that unlike the sun, the earth isn’t even close to being an isothermal black body radiator; and most of the surface LWIR emission can be traced to the earth’s hottest desert areas, with surface Temperatures often 60 deg C and more, at which Temperature, the Thermal radiation spectrum is almost twice what it is at 288 K. Moreover the spectral peak of that hot desert emission moves from 10.1 microns (at 288 K) to 8.75 microns, which is further into the water vapor atmospheric window, and also much further from the CO2 15 micron band, which reduces the effect of CO2 absorption even more. At the other end, the very cold regions of the earth have BB like emissions that are more than a factor of 10 lower than the tropical deserts, so they emit very little LWIR at all (1/6th of the 390 W/m^2). Moreover that cold zone LWIR peaks right on the CO2 15 micron emission band, and yet the CO2 fails miserably in keeping those places warm. The sun heats the earth’s atmosphere; but at the expense of cooling the earth’s oceans, since that absorbed solar spectrum radiation will NEVER reach the deep ocean storage, as the transmitted visible solar energy does. The warm(er) atmosphere from surface LWIR GHG heating, accomplishes very little heating of the oceans since the downward LWIR 15 micron energy has an absorption coefficient in water of around 3,000 cm^-1; well it’s at least 1,000 at 10 microns which would be the peak of the thermal emission from the atmosphere. That means the irradiance drops to 1/e, or 37% in from 3.3 to 10 microns, so 99% is absorbed in the top 16.6 to 50 microns of the ocean surface, and simply results in prompt evaporation. And I’m sure that Eli, simply made a slip of the tongue in saying that the sun’s Boltzmann distibution went essentially to zero at the Long solar wavelengths. The solar spectrum is a Planck distribution, and not a Boltzmann distribution; but Eli knows that. So is MikeB the same person as JohnB? Or another example of TTT? Sorry Mike, AR3 specifies that CO2 doubling = 3.7 w/m2 = +1 degree at “the effective blackbody temperature of earth” which is 255K. Surface temperature of earth is 288K according to AR3 and AR4. To increase the temperature from 288K to 289K requires 5.44 w/m2. To increase the temperature from 255K (which occurs at about 14,000 feet on average) takes about 3.7 w/m2. Nice try at a misdirect though. Dear moderators, may I ask what happened to my last comment? JohnB, I think your equating pixies with bright sunshine ends your chance of being taken seriously. While I am in rant mode, let’s not forget the IPCC’s misleading use of the “CO2 doubling”. They whine on about CO2 doubling = 3.7 w/m2 = +1 degree, but they do all their calculations against the “background” CO2 levels of 278 ppm. We haven’t been at 278 ppm of CO2 for DECADES! 278ppm is meaningless. If we are going to put policies in place in terms of what CO2 does, how about we start with reality, which is that we are near 400 ppm already. Since CO2 is logarithmic (according to the IPCC) the starting point is immaterial, each doubling results in +3.7 w/m2 = 1 degree. So let us use the starting point THAT WE ARE AT RIGHT NOW. 400 ppm doubled = 800 ppm. So, to drive just one more degree (according to the IPCC) which turns out not to be one more degree, but more like 0.6 degrees at the surface (you know, where we and the entire biosphere actually live) (and keeping in mind that the 0.6 comes from the IPCC) we would need at peak oil consumption (which we passes already) about 200 years to get just one more degree from where we are right now. 200 years! To get +2 degrees from where we are right now would require 1,600 ppm which would take about 600 years to accomplish. That’s not my numbers, that’s the IPCC’s numbers! The fact is that anything over 400 ppm of CO2 is subject to the law of diminishing returns, and becomes increasingly inconsequential, a fact which the IPCC carefully over looks in all of their reports. The present every bit of information as if increasing CO2 will result in acclerated warming when even the science they themselves quote makes it very clear that additional CO2 can have no other effect than a DECREASING impact on temperature. No, we’re not the same person, although I can see why you might think that. We realists do all tend to sound the same. Why? Because there is only one actual reality, as opposed to a seemingly limitless supply of alternate realities. Although the Sun does emit in the near-infrared, it does not emit any significant IR above 4 microns. Come on – you all know better than that. The Sun emits many thousands of times the amount of IR that the Earth emits. However, at the top of the atmosphere, the energy in those bands is small because of the 1/r2 decrease in intensity. In other words, the observed solar intensity is small because the Sun is far away .. not because it emits less. JohnB, glad you asked. And thanks for confirming that you don’t think for yourself, but instead prefer to fall back on your constant weak appeals to authorities which have, every one of them, been corrupted by piles of annual grant money, by endless paid jaunts to international holiday party venues; by activists working tirelessly to insinuate themselves onto Boards, by status, by hefty journal and dues income, and by all the other corrupting influences that have destroyed the legitimacy of formerly respected journals and professional societies. With credulous head-nodders like you supporting them, they can cruise indefinitely on the grant gravy train. As for your wholly bogus 97% number, that has been deconstructed so thoroughly here, and so often, that it gets tedious explaining it to you over and over again: your “97%” number is based on a rigged question answered by only a handful of respondents. Contrast that with the 31,000+ degreed scientists and engineers [more than 9,000 of them PhD’s in the hard sciences], who have co-signed the OISM Petition stating that the rise in CO2 is not a problem, and is in fact beneficial to the environment. The alarmist crowd cannot come close to those numbers. So much for your bogus ‘consensus’. To the extent that ‘consensus’ matters in science, skeptics are far more numerous, as the numbers show. As for your appeal to “the mainstream”: Mao was mainstream. The Red Guards were mainstream. Lysenko was mainstream. Eugenics was mainstream. Bleeding as a remedy was mainstream. Naziism was mainstream. Sharia Law is mainstream. Pol Pot was mainstream. And yes, the fabricated climate scare is mainstream. Great company you’re in there. You ask what I would accept as evidence. Apparently you comprehend nothing that has been explained to you: testable, empirical data is scientific evidence. Ice core data from both Hemispheres is evidence, and it shows that rises in CO2 always follow rises in temperature. Oxygen isotopes from stalagmites are evidence. Contrary to Michael Mann’s carefully cherry-picked treemometers, they show conclusively that the MWP was warmer than today, and the LIA was colder. The tropospheric hot spot would be evidence of rapid global warming – if it existed; but it doesn’t. Satellite temperature records are evidence; but they do not support your belief system, and further, they show that the planet is greening in lock-step with rising CO2. The centuries-long daily CET mercury thermometer record is evidence; it also contradicts your belief system. Quite a few other cities have mercury thermometer records going back centuries, and they reflect the same long term global trend as the CET. Data from those sources are evidence. But peer-reviewed papers based on models are not evidence. They are speculative opinion, based on GIGO [gospel in; grants out]. GCMs are not evidence. UN/IPCC Assessment Reports are not evidence. And so on. You are ignoring empirical, testable, reproducible scientific evidence, and instead placing your belief in the opinions of individuals and groups that are financially benefitting from climate alarmism. That’s not smart, John. Not smart at all. OK, slow down with the Gish Gallop. Let’s talk CO2 lag. Of course CO2 didn’t initiate warming, pre-industrial revolution, as we weren’t buring fossil fuels. The 800 year lag in the 10,000 year ice age cycles is well understood. The Milankovic cycle starts the warming, the oceans outgas CO2, which then causes more warming. CO2 is a feedback. But it takes hundreds to thousands of years. Now, things are different. We *are* burning fossil fuels and so now CO2 is a forcing. It’s not that complicated. And BTW, accepting the work of scientists in their field of expertise is not an appeal to authority, it’s common sense. It was found that α [absorption by the air] changed from day to day, and with the clearness and hygrometric state of the atmosphere, but the mean absorption of the radiation from a vertical sun was, according to Pouillet, about 20 per cent. Charles Griffin and Company, 1925. Not any longer. Anyway not in the field of “climate science”. Generally, if what appears to be a scientific statement has political implications, it should be treated like a political statement possibly being biased, ideology driven or fraudulent. All these attributes can be easily found in the AGW “scientific” statements. And thus, having presented not a single orginal thought, not a single contribution to the discussion of the science, no information at all other than “the IPCC said so, and I believe them, so there!” he marches off in triumph, certain that he has bested his foes simply by declaring his belief system. Anthony, seriously, you’ve got to do something about attracting a better class of troll. Time was when trolls on this blog raised actual issues and discussed actual science. Sure they got to looking awful silly awful fast, but at least we all learned from the discussion. The current crop of trolls seems incapable of articulating an argument other than “it was in a journal” or “the IPCC said so”. I cannot think of a more idiotic statement. Do you mean we do not check the work of “experts”? Then it is common sense to have blood letting.. flat earth.. etc etc..
trace backradiation wrt humidity. These are very simple expirements. Fourier is the “Father of the Greenhouse Theory” which only goes to show that they have never bothered to read – or have not understood a word of what he wrote. You couldn’t make it up, except somebody did… Someone who knew real physics, maybe several from different disciplines, must have had a great laugh putting together this AGW fisics and creating the meme ‘proofs’ like the spontaneous ideal gas diffusion of their molecules which they’re taught by its own molecular energy overcomes gravity to zip at great speeds into their atmosphere of empty space and thoroughly mixing by bouncing off the other ideal molecules is ‘proved’ by opening a bottle of scent in a classroom. As well as saying that direct heat from the Sun doesn’t reach Earth’s surface, or they’ll admit to 1%, another of the memes they have in conjunction with “electromagnetic energy from the Sun is all the same” is “absorbed”. “Absorbed” meme means “it creates heat”. So, they say that all this nondescript “all electromagnetic energy is the same is absorbed and absorbed means it creates heat, therefore visible light heats land and oceans” – when it’s pointed out that visible light is scattered by the electrons of the molecules of nitrogen and oxygen in the atmosphere because these molecules absorb visible light – they never come back to answer my question, how much does this mean visible light heats the atmosphere? Yep, showing the difference between Heat and Light.. That visible converts to chemical, not heat, energy in photosynthesis and, that direct heating is by the real direct heat from the Sun, the thermal energy direct from the Sun, which actually is capable of heating land and oceans and us, of doing real work, and yeah, you can get a bit of electricity out of visible …, but only someone who knows the difference can see what is being said here. It goes over the heads of those who think the AGW meme “visible heats land and oceans and thermal infrared from the Sun doesn’t reach the surface”. So they’re not really lying..
Isn’t it actually saying that c59% of incoming “solar” energy is thermal infrared? And of that practically all of it must be reaching the Earth’s surface as direct heat before going back into the atmosphere by driving the weather systems. Because, water vapour is lumpy and anyway is but a small percentage of the total gases in the atmosphere. p.s. that leaves 41% for UV, Visible and Near and Short Infrared – none of which is thermal, i.e., none of these is direct heat from the Sun which is capable of moving matter into rotational/vibrational states and so heating it up. “Reflected” means that these are put into the category Light, not the catergory, Heat. Not only because they are not hot, but as light they are reflected rather than absorbed, like reflective infrared red cameras v thermal imaging infrared cameras. The first captures the reflection of infrared off a body, as do normal visible light cameras, and the second measures how much heat is being radiated out from a body’s internal heat. The difference between Light, sometimes called reflective, and Heat from the Sun. Although it goes a bit of the way to making things clear in pointing out that there are great differences in the order of magnitude between these wavelengths and not as the picture shows, it doesn’t deal with the appearance of visible being near pinhead size – and this is thermal infrared size, because visible will be even smaller than near infrared which is itself microscopic. Thanks JohnB, I’ve just finished 3hrs worth of work cleaning the kitchen, I needed some light relief. Water trails off where CO2 absorbs the most, so about half of that bulge is already captured by water. The other two peaks sit in the middle of the distributions so are mostly irrelevant. On the second chart “Total Absortion and Scattering” you can imagine a line which starts from the top right where water starts to trail down, cuts through CO2s effect and aligns where water continues falling. By my estimation that shows water is already blocking more than half in that band in which CO2 has effect. With regard to the statement repeatedly made by some here about the “overlap” between H2O and CO2 absorption bands; Phil has made the point several times that these absorption “bands” are actually hundreds of very fine lines, each with it own specific frequency, characteristic of the structure and electronic states of the H2O and CO2 molecules. These frequencies are firsst order Temperature independent, since they are not part of any thermal continuum spectrum, which ios highly Temperature dependent. So the fact that H2O and CO2 bands overlap, does not mean that the individual lines overlap. I am sure some of them do, but generally they don’t. I was looking at a section of an IR spectrum, in The InfraRed handbook. ; absortion of a ten km horizontal atmospheric path at sea level, covering wavenumbers from 10900, to 11200, which is about an 0.025 micron wavelength range. The graph, just selected out of a larger spectrum, for effect, has something between 100 and 200 spectral lines in that 0.025 microns. Now remember this is a sea level path through 10 km of air and molecules. So whatever line broadening due to Doppler, (Temperature) and density (collisions), is in effect here, and the individual lines are still being resolved. So H2O and CO2 lines can and do interleave, even through there is band overlap. And Phil has reminded us about this several times; but some choose to ignore it. There’s also a plot of a N2 absorption from about 3.75 to 4.75 microns. Carbon Dioxide is fully part of the Water Cycle, all pure clean rain is Carbonic Acid (as is fog, dew, etc.) As fully part of that its main role in cooling the Earth from the 67%deg;C it would be without the water cycle, taking away heat from the Earth. In other words, there is no Greenhouse effect because the 33°C figure given for its supposed ‘greenhouse gas warming’ from -18°C to 15°C, doesn’t exist, it’s an illusion created by taking out the water cycle which cools off the heated Earth through our weather systems, here as hot moist air rises because lighter than air cools off in the higher colder atmosphere and condenses out back to liquid water or ice, giving up its heat to cool the Earth by 52°C – think deserts. Convection is the method of heat transfer in the Earth’s weather systems, because there’s a real gas atmosphere around us subject to gravity etc., not empty space full of the imaginary ideal gas hard dots of nothing molecules zipping around at great speed bouncing off each other and the walls of an imaginary container, which do not have volume or weight or attraction, where there is no sound and clouds appear by magic. There is a great deal of difference between the beam heat direct from the Sun, the concentrated travelling in straight lines thermal energy of the Sun on the move to us capable of doing work, thermal infrared, and the dissipated thermal energy in the upwelling from Earth, directionless and insignificant in the greater movement of real volume gases in convection from our heated Earth, our wind systems created by differences in temp/pressure of volumes of hot and cold air. AGWScience Fiction doesn’t have this – it can’t account for wind either. Except what it produces in insult to real physics, as someone put it, by pulling it out from below the belt line..
As others have asked, where is the detail of this study? What were they measuring? Thank you Myrrh for your comments on: June 16, 2012 at 4:50 pm and June 16, 2012 at 5:51 pm. These old-timers wrote nothing they had not researched or found out by experimentation. Also note that they used the term radiation long before Electromagnetic (EM) Radiation was theorized & discovered by experimentation. They also knew that the smallest building blocks of matter or what we now call atoms would vibrate at different speeds as they gained or lost energy. – When molecules were touching these vibrations were transferred by touch and this had to be distinguished from the newly dicovered EMR and was named conduction and rising hot air got the name convection. Nowadays, unfortunately, every kind of heat-transfer is called EM Radiation. Climate science specifically excludes the facts that disagree with the theory. The hockey stick is a prime example. Only those trees that match current temperatures are used, while the trees that don’t match are hidden from the study. The problem is that those trees that don’t match, they are telling you that the trees that do match are likely an accidental match, that you can’t place much weight on their reliability. So, by hiding these trees, climate science makes it appear that trees are a much more reliable measure of temperature than the evidence supports. Why do this? Because Climate Science is a pseudo science. It is not searching for the truth. It is searching for evidence that supports a predetermined conclusion. The evidence that supports this conclusion is included in the studies. The evidence that does not support the conclusion is hidden from the final report. “Hide the decline” as revealed via Cliamtegate is a prime example of this, where the IPCC poster child was shown to be a result of selection bias. A more recent example is the “southern hemisphere hockey stick” which was recently retracted from publication. In this case the “experimenter expectation” effect likely played a role, where an obvious mistake got past the researchers, peer review, and “climate scientists” such as “Real Climate”. Instead, the error was first publicly identified on Climate Audit. After the fact the researchers claimed they discovered the error first, but this was only after CA Audit published the error. If in fact the researchers did discover the error first, it suggests they knowingly withheld this from the public until CA announced the error. This raises the question about whether the researchers would have released their knowledge of the error except for CA. If Climate Science history is an indication, they would not have made this error public. They would have allowed the erroneous paper to go forward, because it supported the predetermined conclusion. Well the last time I checked, the human eye stopped responding to electromagnetic waves, and converting that energy into the mental machinations in the eye and the human brain to produce the sensory effect that we call “LIGHT”; which therefore by definition IS visible, around an upper limit of 800 nm, and a lower limit of 400 nm. Gosh, what does that mean? You have a strange way of phrasing when you talk about heat and light. Now if you’d said the eye converts visible energy into chemical energy which is the first step in the process of vision, that would make sense. Just as plants convert visible light to chemical energy in their process of photosynthesis to create sugars. Note, photo – means light, not heat. Visible light is not converted into heat, which is thermal energy, but into chemical energy. “The retina contains a chemical called rhodopsin, or “visual purple.” This is the chemical that converts light into electrical impulses that the brain interprets as vision. The retinal nerve fibers collect at the back of the eye and form the optic nerve, which conducts the electrical impulses to the brain. No it isn’t. The visible light energy as such doesn’t exist any more inside our brain, it has been first converted to chemical energy, activated rhodopsin, which then produces electrical impulses which show us the property of it, which colour it is. The colour is not the visible energy itself. Visible light, the energy, is capable of producing electricity, that’s how its energy is captured in photovoltaic cells in solar panels. It is not capable of heating matter which requires a more powerful energy to move the whole molecule of matter into vibrational/rotational states, kinetic energy. “Biophotovoltaic tableMoss Table comprises of conductive fibers that captures electrons to produce energy. Biological materials like cyanobacteria, vascular plants, algae and moss indulge in the act of photosynthesis, which is exploited in a useful way. A lot of energy is wasted during the process of photosynthesis, but with this technology it will be used well. The table includes little moss pots that double as bio-electrochemical devices, which in turn convert chemical energy into electrical energy with the help of various biological materials or photosynthesizing plants. Neither do we create the thermal energy absorbed by us, as we don’t create “by definition that is visible light”. We first perceive, sense, the original thermal energy on our skin, as we perceive light, as the property, nature of it. The energy of movement, which is itself heat, which is thermal energy. Not to be confused with temperature, see heat capacity of water. Rub your hands together, that is mechanical energy converting to heat. So note, it’s not the original heat energy from the Sun. Heat heats things up, creates heat, which thermal energy can be transferred by conduction, convection AND radiation. So, the thermal energy of the Sun, heat, on the move to us, heat, is absorbed by us and land and oceans, and heats us up which then becomes our own thermal energy, heat. They’re not talking about infrared light, they’re talking about thermal infrared radiation; near and short infrared are not thermal, they’re classed with Light, not Heat. That’s why this is about “thermal infrared spectrum observed”, from the Greek thermo, heat, not photo, light. “Photosynthesis should make any short-list of Nature’s spectacular accomplishments. Through the photosynthetic process, green plants and cyanobacteria are able to transfer energy from sunlight and initiate its conversion into chemical energy with an efficiency of nearly 100-percent. If we can learn to emulate Nature’s technique and create artificial versions of photosynthesis, then we, too, could effectively tap into the sun as a clean, efficient, sustainable and carbon-neutral source of energy for our technology. How much is absorbed by H2O and doesn’t end-up absorbed by these greenhouse gasses? How much is absorbed by these greenhouse gasses that would be absorbed by H2O anyway?